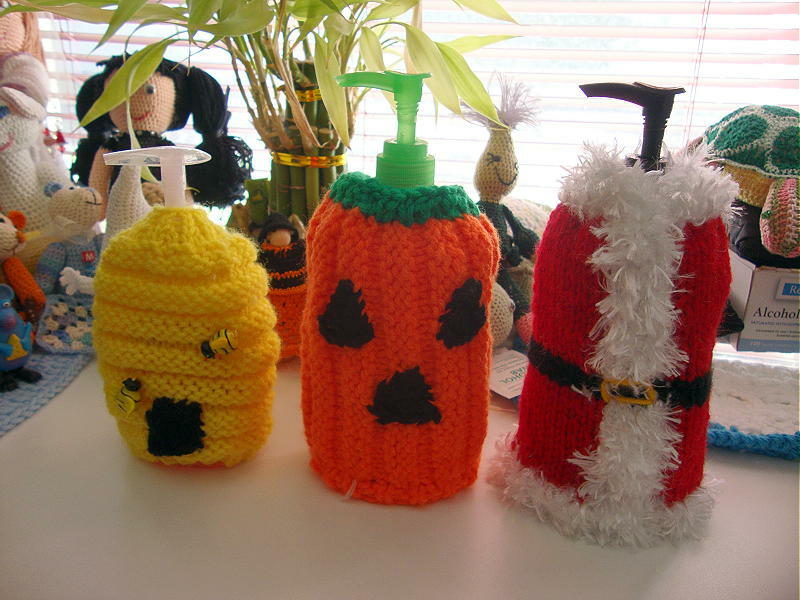 I made some bee hive bottle covers. 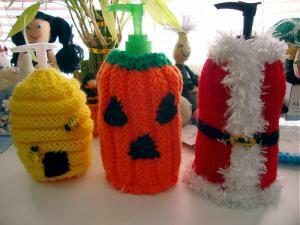 So it was asked if I thought about changing the pattern a little and making them for other Holidays? I did, but not really hard. Anyway it kept nagging at me and I just had to put my crochet hook down and pick up the knitting needles. Now with a few changes, I think I did ok. See what you think. Mary Jo you did an awesome job. They are even cuter than than the ones I was seeing in my head. They came out great!! Very cute! Those are just so clever. They're all so cute and I think that you did a great job too. Those are fantastic! Good job. You did great! I'm thinking the Santa one must have been a little more time consuming, what with the white trim but they are all beautifully done. oh they are precious! You keep our eye candy quest going!!!! Clever! I just bought a little teapot to make cozies for; I've just finished a pumpkin but I think I will steal your Santa jacket idea. Thank you all and let me say the Santa suit was knitted as one piece. The fur is ww white yarn and white boa yarn. They were fun to make. I am, at a later time, try and make a turkey cover . That is sitting in my head.